I've been using mirrorless cameras since summer of 2009. A lot has changed since then, and as I note in my awarding the E-M5 this years Serious Camera of the Year award, a mirrorless camera has now completely replaced one of my DSLR sets for one type of shooting. 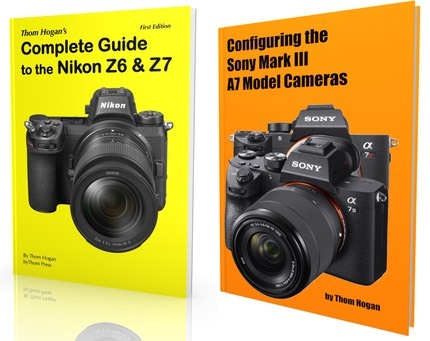 Continuous Action — Fast moving subjects are trouble for virtually all the mirrorless cameras, with the one exception being the Nikon 1 models. Continuous frame shooting with moving subjects on all the other mirrorless models is much more hit or miss than with a DSLR. Good news: focus on static subjects and single focus acquisition is now quite good, and often at DSLR levels. Night Moves — When the stars are my subject (celestial, not Hollywood), out come my FX DSLRs. That's not to say you can't shoot the Milky Way with a mirrorless camera, but the results just aren't the same unless you stack multiple images. Good news: This year's models took a step forward in this respect, but they've still got a ways to go before I'll be relying upon them. Nearer to Thee — The grizzly bear is a quarter mile away (if you're following NPS rules). Cross off the mirrorless Fujifilm, Leica, Samsung, and Sony models from your camera list. The Canon and Nikon only get there with bigger DSLR lenses used via adapter, and realistically, only the Nikon V1 truly turns into the system you want (you don't want to be holding 810mm equivalent away from your body using a color LCD to compose). The Olympus and Panasonic have 300mm (600mm equivalent) options, but in practice I've found those to be a bit tricky to get consistent top level results from. Sometimes mass is good. Mass on a Wimberley head is better, and that's where the big DSLRs and exotic telephoto lenses shine. Mirrorless isn't there yet. Black Cat in the Coal Mine — While low light performance has gotten far better in the latest round of cameras, we're still not all there yet. If you're relying upon contrast AF in low light, you'd better hope you've got an AF Assist light that isn't blocked by your fingers or lens hood. Some of the EVFs and LCDs aren't so good in low light, either (why did that get worse from the V1 to the V2?). The good news is that most of the recent mirrorless cameras can produce credible results in low light, and some can produce images that we would have paid more for just five years ago.